I recently had the opportunity to work with a piece of kit from Tefal called the OptiGrill. I have to emphasise I am under no obligation to share my recipes here on the blog. However, I am genuinely impressed with the grill; how it cooks food, how I was able to use it for many versatile meals, and it has even converted my other half to cooking at home more. To get my hubby cooking more is a big thing for me. He is, believe it or not, a very talented cook and excellent assistant to me in the kitchen. For some reason though he reckons that he can’t eat a thing that he has cooked himself and so if I’m not around to cook meals he will cook for the kids but not for himself. The busier I become with various work projects, the more important it is for him to fend for himself, as otherwise we’d all be eating whatever recipes I’ve been developing. For example, last week, we would have eaten strawberries 7 days in a row if he hadn’t cooked up dinner for us. This is one of a number of simple recipes that I developed for the OptiGrill and I’m sharing it here with the kind permission of Tefal. Please ensure all ingredients are at room temperature and you have lightly oiled the Tefal Optigrill before first use (as per the instruction booklet). Preheat the OptiGrill on the “poultry” setting. Once the indicator says the OptiGrill is to temperature, place the turkey steaks on the grill and close. Slice the red pepper into large, long slices, about 5cm across. Open once the indicator flashes yellow, open the OptiGrill add the red pepper slices around the turkey steaks and close. When the indicator flashes red, remove the pepper and turkey steaks from the grill and cover. Place a tortilla flat on the grill and close for 20 seconds to soften the tortilla (this makes it easier to handle and roll). 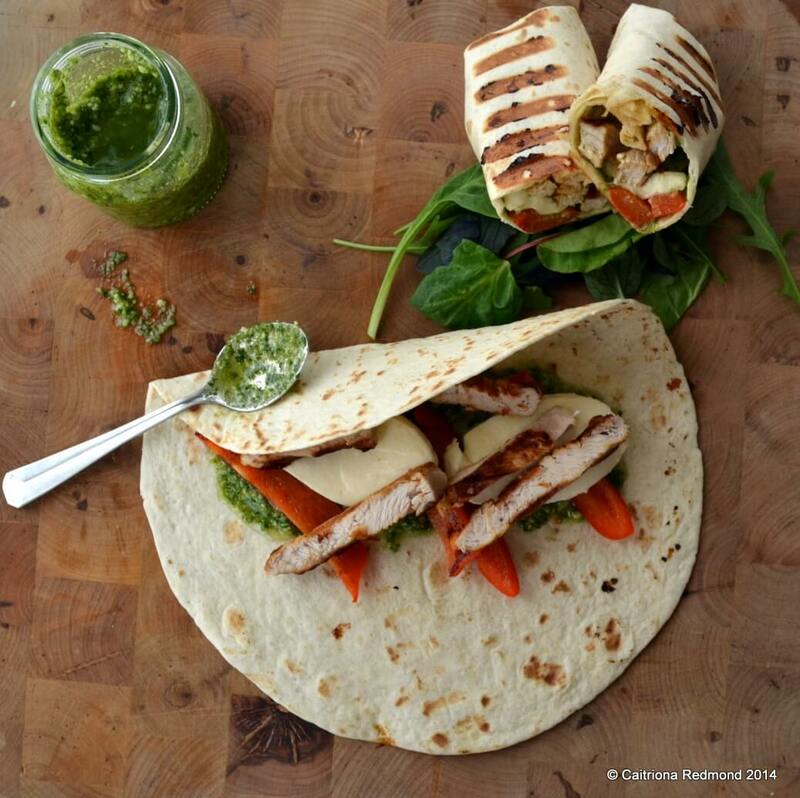 Remove and spread 2 tablespoons of pesto in the middle of the tortilla, next add half the grilled red peppers. Slice the first turkey steak and place into the wrap, add half the mozzarella and roll into a tight parcel. Repeat for the second tortilla. Set the OptiGrill to the “M” setting. Place the parcels onto the grill and close for 3 minutes. Carefully remove the parcels and slice in half before serving with a fresh green salad and cherry tomatoes.